This year, Musikmesse (7 to 10 April 2016) and the Society of Music Merchants (SOMM), the association of the musical instrument and equipment industry, are offering an extensive personal development programme for trade visitors from the musical-instrument sector for the first time. The seminars, impulse lectures, workshops and keynotes are free of charge and advance registration is not necessary. “The Business Academy programme is aimed specifically at the needs of the musical-instrument sector and thus oriented towards subjects of particular relevance to the sector. 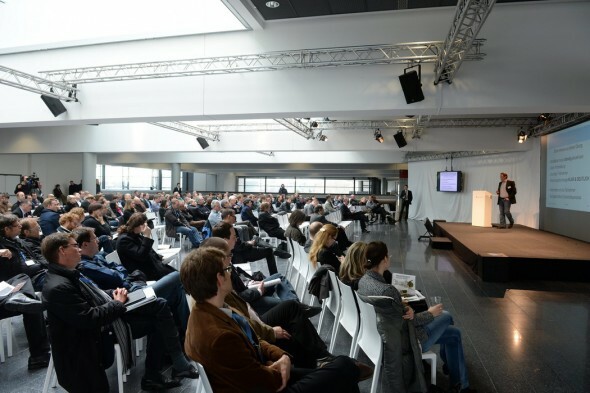 In cooperation with SOMM, top speakers, consultants and coaches from the business, legal and scientific worlds will pass on up-to-the-minute expertise in a varied blend of practice-oriented lectures, discussions and workshops”, explains Stephan Kurzawski, Senior Vice President, Messe Frankfurt Exhibition GmbH. “The spectrum covered by the Business Academy stretches from power and expert workshops for middle and senior specialists and managers to impulse lectures for retailers, wholesalers and manufacturers, as well as newcomers to the sector”, adds Daniel Knöll, Managing Director of SOMM. At the Business Academy inspired by SOMM in the Business Plaza (Hall 11.1), trade visitors will have the opportunity to attend a variety of power seminars and workshops on a wide range of subjects of relevance to the sector in the mornings and afternoons from Thursday to Sunday. There, experts, marketing gurus, social-media professionals and specialist lawyers will examine core topics of relevance to the musical-instrument and equipment sector and discuss important issues. In this connection, the focus of the organisers’ attention will be on modern professional development in the musical-instrument sector with the aim of strengthening the competitiveness of participants in all market segments. This includes profound knowledge of the opportunities and risks in the market and how external influences affect the situation in the market. Thus, even small changes to a company’s strategy can results in increased sales while good training can lead to greater safety and security in the own company”, says Daniel Knöll. Thus, the 35-minute workshops and impulses lectures of the Business Academy inspired by SOMM will spotlight subjects such as communication & sales, law, compliance, marketing and facts & figures about the musical-instrument market. Thus, the individual talks will focus, for example, on sales communication, sales rhetoric and the best way to handle complaints. In the field of law / compliance, the lectures will revolve around issues such as the best ways to react to written warnings, tips and tricks for dealing with parallel imports and goods seized at the border, as well as observing legal cases relating to internet sales, WEEE updates, and the legal basis for using YouTube, Twitter, Facebook & Co. Additionally, specialists will look at shop window design and presentation, the correct use of social-media tools and the abilities and skills necessary to use them. There will also be talks on transferring business ownership and business successors, as well as expert recommendations on cultural networks and fund raising, not to mention ideas for perfect events at the POS. Among the subjects covered will be the correct use of web shops and how retailers can creatively counteract their competitors. Detailed information about the individual workshops and impulse lectures, as well as the expert speakers, will be published successively on the Musikmesse website at www.musikmesse.com/business in the coming weeks. For more information, please visit our website at: www.messefrankfurt.com . SOMM – Society Of Music Merchants e. V. – is the central association of the musical instrument and equipment industry in Germany – and represents the interests of 60 companies from the manufacturing, sales, retail and media segments of the musical-instrument business. These companies account for around two thirds of the German musical-instrument market. The central association represents the cultural and commercial interests of the music instrument and equipment industry in Germany and Europe. Its aim is to strengthen the sector’s competitiveness in all market segments; to help to shape the political and legal framework in accordance with the sector’s requirements; to define market services and provide services to members; to promote up-to-date musical basic and advanced training; and to strengthen active music making and musical skills in society.